Here’s a portion of the Cocoa Beach crowd. Photo courtesy of Ross Dando. The Prototype Rails Prototype Modeler meet wrapped up in Cocoa Beach recently. 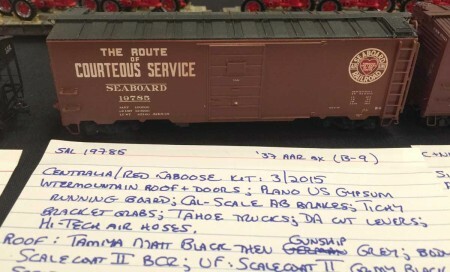 Railroad modelers attended from all over the United States and one flew in from Sweden. Fifty speakers offered a variety of presentations through two and a half days for the 250+ attendees. 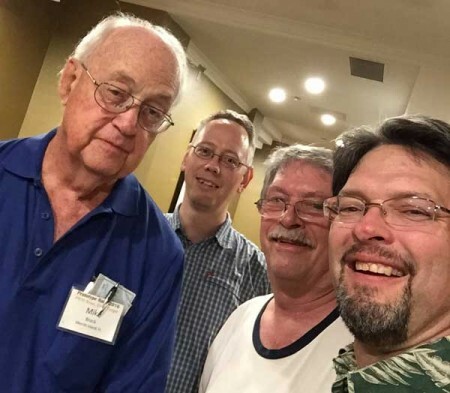 Four modelers sent along their impressions of the event and some photos. 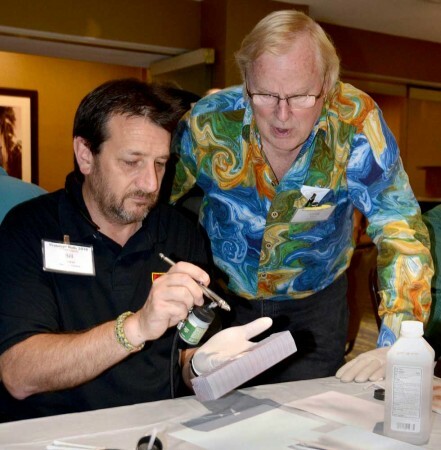 We hope these personal stories and images inspire readers to attend a railroad prototype modeler meet in 2016. Click on any image here to review a larger size. My first RPM was the product of wanting to finish the Shake-N-Take car that was the last project Richard Hendrickson helped inspire. I never met Richard however after replying to a comment on a YahooGroup, he supported my project research by sending me pictures when he found them over many years. Greg Martin had sent parts for this years project and I wanted to finish it. I was successful and it was amazing to see so many versions of the same car in Cocoa Beach. While each was the same car, we all chose different ways to accomplish various tasks to reach the end goal. A table of completed Shake-N-Take models from past Prototype Rails events. Photo courtesy of Ross Dando. I was amazed at the variety of other models that were on display. Seeing work in progress really helps me understand the steps to build something. In addition, the vendors were great to meet and interact with. Many of them introduced me to other vendors who had more of what I was looking for. Meeting the various photo vendors was a highlight, as each was able to provide subjects for kits I already have and now I have more clear pictures to work from. One of many in-process models on display. We hope to hear more from Bill Welch with more about his model scultping techniques on this model. Photo courtesy of Jeff Sankus. The biggest moment of attending this year has to be meeting all the people I have interacted with in the various online groups and sites. The list is long and I am sure if I were to try to list them all, I would miss and offend someone. I walked away a bit overwhelmed by all the available information, however I also walked away fired up to model and contribute. I want to work on a project and share it with the rest of the gang. RPM is not about a railroad, a specific car or a model. RPM is about sharing what you have learned and what you know. I greatly appreciate the dedication and efforts of the team who pulled off this event. I will be back! The usual suspects? Prototype Rails co-coordinator and cookie distributor Mike Brock is on the left. Colin Hart, Greg Martin and Ross Dando join Mike from left to right. Photo courtesy of Ross Dando. I attended Prototype Rails 2016 for the first time this year and took in many clinics over the three days. One clinic in particular, that interested me was airbrushing with acrylics, as I had previously had met with no success using acrylics in my airbrush. Very quickly, I learned that the airbrush I was using was an external mix and acrylics should be airbrushed using an internal mix airbrush. The light came on for the reason of my poor results and my going back to spraying lacquer based paints, which are getting harder to find. Then, Bill Welch and his helpers offered a hands-on session airbrushing acrylics. It all came together as I used a Badger airbrush to spray. Coach Bruce Smith uses a cotton bud for quick cleanup on the business end of a Badger 155 during the Live Fire airbrush event. Photo courtesy of Greg Komar. The knowledge clinicians and camaraderie of all attending, sharing their modeling skills by displaying excellent models and sharing what they did to their models, make the event well worth while. I plan on returning next year to this excellent event. Coach Greg Moe stands by with Bill Dewar during the Live Fire airbrush event. Photo courtesy of Greg Komar. I was able to attend this years 16th annual Prototype Rails, otherwise known as Cocoa Beach, held in Cocoa Beach, FL at the CCB Hilton on January 7th, 8th, & 9th. The CCB area is a beach resort with many restaurants and shops and Kennedy Space Center is within a short drive. Al Brown displayed this Shake-N-Take Rock Island automobile box car. Photo courtesy of Jeff Sankus. This event is somewhat intense as there are six hour-long clinics running at the same time. The clinic schedule starts at 9 am and the last clinics end at 10:30 pm with an hour break each for lunch and dinner. The schedule is well orchestrated allowing at least 45 minutes between the clinic sessions to mingle with the 263 attendees. The clinic subjects vary as there is something of interest for everyone. 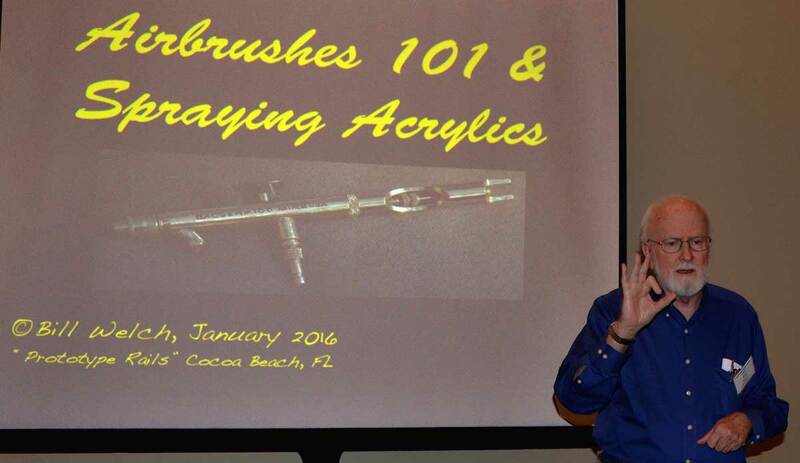 Bill Welch begins his Live Fire airbrush clinic. Photo courtesy of Greg Komar. 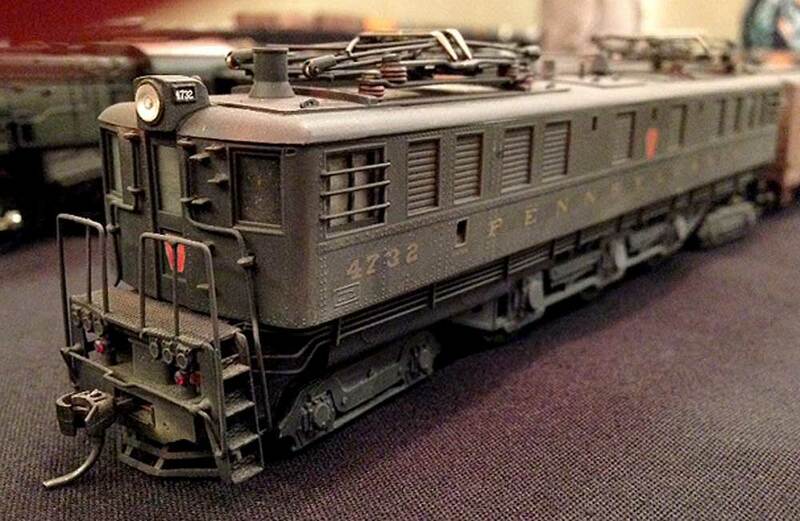 There is also a sizable banquet room that is shared by many finely crafted personal models on display as well as quite a few vendors and a vast N scale modular layout. The room size affords more vendors to display. One of many impressive models Bruce Smith had on display. Photo courtesy of Jeff Sankus. The model display room offers lots of inspiration. Ross Dando snapped this photo to capture details so he can build a similar model. I was privileged to be a part of this years Shake-N-Take hands-on clinic. Each year, a group of dedicated modelers create a plan to build an off the shelf freight car kit to be of RPM quality. 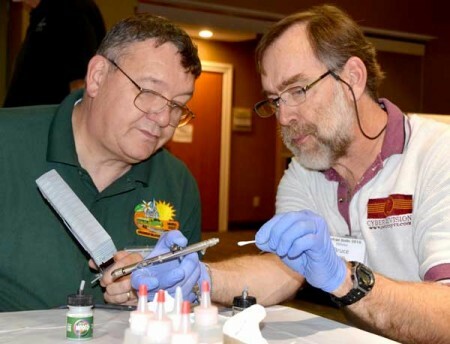 This plan involves obtaining the original kit, extra detail parts and correct decals, writing new instructions, and presenting the results in a clinic to the 30 lucky people who previously signed up to receive the typically donated items. 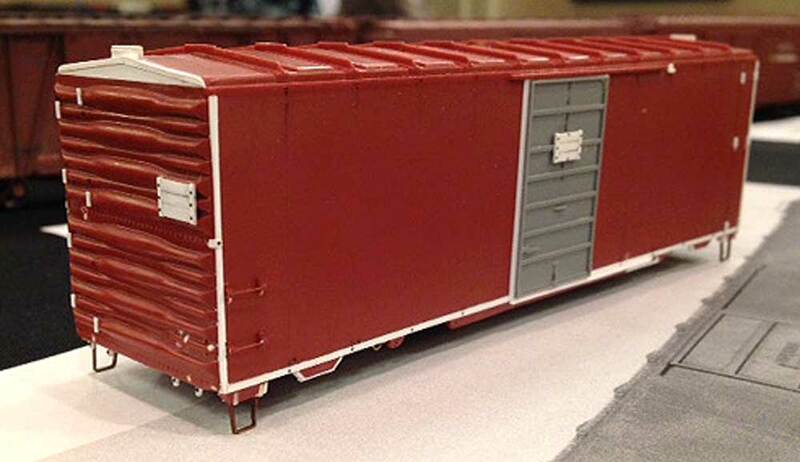 The object is to take the kit home, build and return the following year with your (hopefully) well built freight car. Steve HIle modeled a box car interior with hardware used for transporting a couple of automobiles. This probably falls under Bill Welch’s “Extreme Modeler” definition. Photo courtesy of Ross Dando. This was my first national RPM meeting in at least 15 years. It was good to get back into the community again and reconnect with people that I had last seen 15-25 years ago. Mark Amfahr’s presentation on “Things I Learned Studying Transition Era Operations” was the most thought-provoking session for me, since it highlighted things we rarely use in op sessions: telephone and hand signal communications, occupied caboose handling, stock car handling, and the intense use of switchmen. Mark could do a Part 2 and I would eagerly attend. Dave Owens displayed this military open load on a modified flat car. Photo courtesy of Jeff Sankus. On the modeling side, I was cheered by two great presentations on tank cars, always a dark and complex subject: Steve Hile’s look at UTLX class Z tank cars and Alan Brown’s session on modeling three different tank cars. These sessions were backed up by lots of innovative tank car models and kit bashes in the model display area. Since I have a few Sunshine GATX Type 17 kits to build, this gave me energy to start. Here are two resin freight car producers in casual conversation at Cocoa Beach. 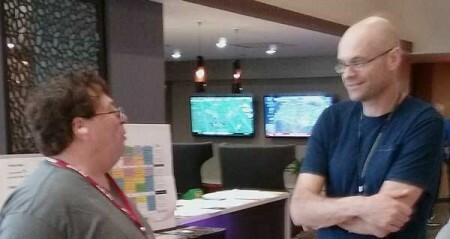 On the left is Steve Funaro and Ted Culotta is at the right. Aaron Gjermundson snapped the photo. It’s a bit fuzzy as all three were “resinating” at the time. We feel these Prototype Rails RPM reflections convey the spirit of the event. A couple of photo galleries can be viewed on line. Many images feature models in the display room and the people involved with the event. 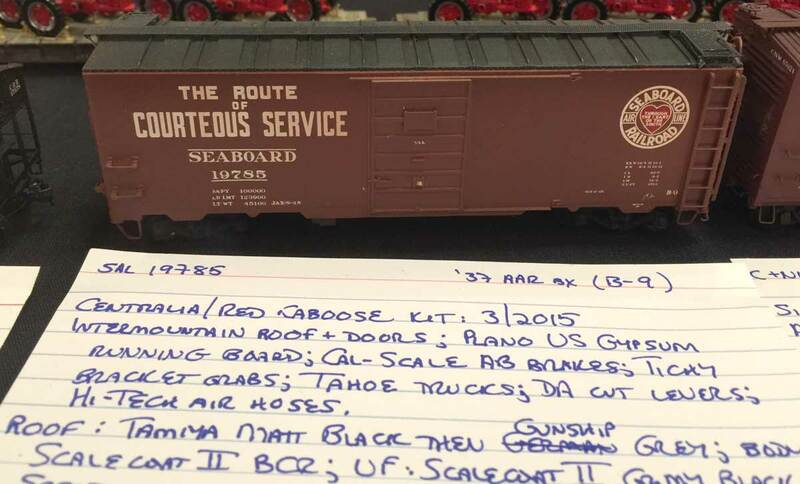 There are several railroad prototype modeler events in the upcoming months of 2016. Here are the dates, places, and event links. While it is not strictly an RPM event, there will be a couple of prototype presentations and many of the operating layouts follow prototype practices at this Oklahoma event. We hope to see you out there at a 2016 RPM event! There is also one very good one in Marion Ohio April 28-30th at Marion Union Station downtown. Thanks Mark! I added the event to the list. Just a note the photo of the interior shot of Steve Hile’s car represents the Type F Evans auto loader used in the Rock Island 40-foot double door boxcar; the SHAKE N TAKE project from 2015. His body shell was immediately behind the display. Steve showed some diagrams of these loaders in his prototype presentation in January 2015. NICE JOB Steve! Bill Welch’s live fire was very well attended and handled just off the lobby of the hotel. Man what a crowd! You should have known that it was going to be a huge success Bill! Thanks for those extra details, Greg!